One Year of 'A Reluctant Contortionist'! A blog about being too bendy. To raise awareness of Ehlers Danlos Syndrome. 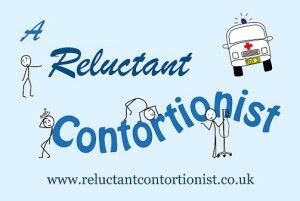 One Year of ‘A Reluctant Contortionist’! Since ‘A Reluctant Contortionist’ launched last November there have been around 2700 visits to this site. 70% of hits come from the UK. Second highest is the USA (10%). It has been viewed from Brazil (4%), Australia (2%), Japan, Poland, Norway, Sri Lanka and the United Arab Emirates. 52 different countries in all. People don’t always stay on the site for long though. The average visitor views 3.7 pages. The most viewed pages on the site are ‘What is EDS?’ (18% of hits) and the ‘Gallery’ (14%), which has photos of my hypermobile joints. I think that suggests the blog is raising awareness and understanding of EDS, as I hoped it would. I’ve tried to publicise this blog in various ways. I’ve had two articles published in EDS charities’ magazines, and there’s another article awaiting publication. Ehlers-Danlos Support UK kindly posted a link on their Facebook page. I got over 200 hits that day alone. I also had some business cards printed. They’re fun to hand out and proved to be an effective way of getting people interested, particularly doctors and nurses. I tried to get an article published in The Guardian during EDS Awareness Month. I didn’t get anywhere, but it was worth trying. I handed out some EDS UK leaflets instead! So quite a lot of effort has gone into this blog and hopefully it has done a little good in the world. It’s certainly had a noticeable affect on my life. People who know me seem to have a better understanding about EDS now and the lifestyle it forces me into. The blog seems to have broken down a layer of awkwardness which was there before. Several old friends have got back in touch with me through the blog too which was really nice. 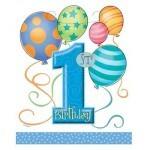 I’m not sure how you judge the success of a blog, but after one year I’m quite pleased. I could have done a few more posts and put more effort into publicity. But I don’t get much free time and didn’t want the blog to feel like work. So I post articles at a pace I find enjoyable. There are several other EDS blogs, but mine seems to be the only one written by a guy. Hopefully it has a slightly unique perspective on living with EDS. ps. Enjoy Star Wars VII. Click HERE to watch the latest trailer. Map of Visitor Hot Spots. « ‘Extra Time’	» Happy New Year! This isn’t actually David Teasdale. It’s someone else. Unknown to Ces. Thus, protected from all the usual rudeness such replies seem to attract. So, as a person outside the family, and unrelated to Harrison Ford, I just want to say that I’m glad you have decided to stick with the blog, because I’ve appreciated it a lot, and admired it, and I feel the numbers and interest justify the creative effort. (It so happens I also live in Reigate. And play the guitar with skill and sensitivity. And rarely mention footy teams, movies and hair loss). It’s good to have increased the number of responders who don’t know you personally. Thank you for anonymously appreciating my blog. I’ve enjoyed writing it so it wasn’t a hard decision to carry on. Hopefully interest will keep building. When I first read your message I wasn’t convinced you’re someone I don’t know personally. But if you really do play the guitar with ‘skill and sensitivity’ then clearly we’ve never ever met. Ever. It looks from the map that you need to put some “ice/snow/Christmas” related topics to get Greenland/Iceland online..
Ha! Thanks HB. I’ll consider your strategy for those regions. Though you may remember from school I couldn’t master basic French, so Icelandic and Greenlandic Inuktitut will be a big stretch. Despite the language barrier my blog is oddly popular in Finland and Romania (38 hits in all). Maybe they like the photos? Hope you had a great holiday. Thanks Kirsty. 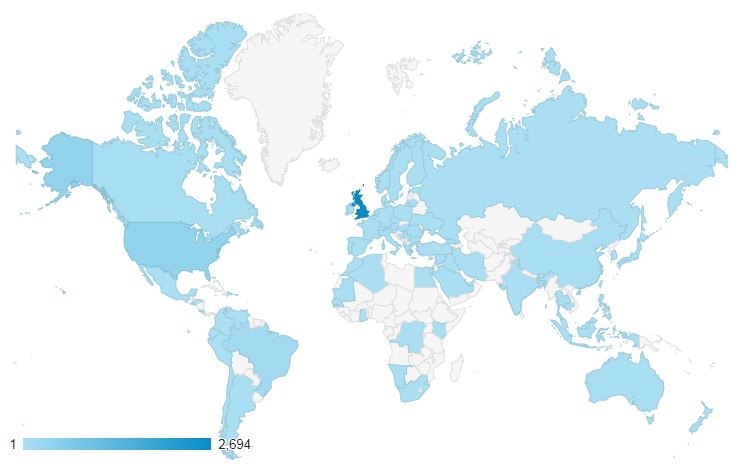 I’m really pleased how much interest it has got, some of it surprising – 4 visits from Iran! Hopefully it’ll keep growing. Great work in helping people all over the world understand more about the condition. You write in a way that is very understandable and clearly this is resonating. I hope you have a great Christmas with the family, give them my regards. Thanks for your comment. It took a while for interest to build, but since the blog has climbed up the Google rankings it’s much easier for people to find the site now. Hopefully visitor numbers will keep rising. I hope you and your family have a lovely Christmas too, and a very happy new year! Nice one Cez. Keep writing mate. We’ll get some marketing support so you can break into the tricky Green/Ice land demographic. I hadn’t heard there’s a Peanuts movie out, it could be great. As it was you that told me I’m letting you off putting it on the same level as Star Wars. Both will add joy to my Christmas, I hope they do to yours too. Have a great Christmas and new year mate. Thanks for your comment. I think this is a brilliantly written and informative blog. I think you have got exactly the right tone to educate and entertain. What a great comment, thank you Scott. Very few visitors to the site leave a comment, so it’s hard to know how people are reacting to it. Hopefully some of my silent visitors formed a similar view. Thank you!